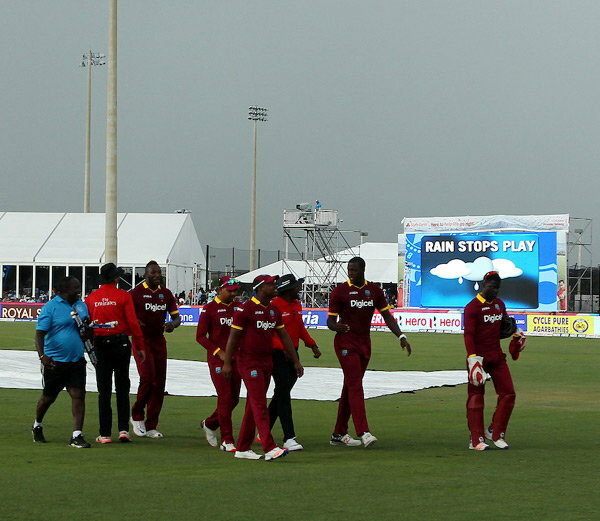 After bowling out the West Indies for 143 in 19.4 overs, India were 15/0 in two overs when the dark clouds hovering over Lauderhill opened up, interrupting the play. Even though the rain stopped, wet outfield meant that the match couldn’t be resumed. In the second match, India’s bowlers showed marked improvement bowling out the West Indies for 143 in 19.4 overs and the team looked very much in contention to share the honours in the series. India opted to bowl and Jasprit Bumrah (2/26), Mohammed Shami (2/31), Amit Mishra (3/24) and Ravichandran Ashwin (2/11) perfectly exploited the West Indian batsmen’s loopholes as the latter struggled from the very start and even failed to play the full 20 overs. Unlike their previous encounter which saw the West Indies hammering out 245/6 thanks to opening batsmen Evin Lewis (49-ball 100) and Johnson Charles (33-ball 79), India’s bowlers operated with discipline and didn’t alllow the West Indies batsmen to swing their bat freely. 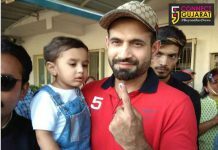 Due to this, Lewis (7), especially, was frustrated as he mistimed pacer Shami for an easy catch for Mishra at short fine leg in the fourth over, with the team’s score at 24. With the West Indies reaching 50/1 in five overs, Indian skipper Mahendra Singh Dhoni brought in Mishra for the sixth over and the leg-spinner, who replaced Stuart Binny in the match, struck on his first delivery. Charles’s innings ended when he failed to clear Ajinkya Rahane at the long on boundary. Later, Indian continued to cash in on the West Indies’ lack of discipline and resoluteness. Off-spinner Ashwin had Lendl Simmons (19) stumped by glovesman Dhoni as the right-handed batsman missed the wide ball outside the leg stump as the West Indies reached 76/3 in 9.5 overs. After these wickets, the West Indies were reeling at 92/5 in 11.5 overs and they were in dire need of a partnership but that didn’t materialise. Bhuvneshwar then removed Andre Russell (13), with the batsman’s hoick at a low full toss ending up in the hands of Virat Kohli at long off. Then Mishra bowled captain Carlos Braithwaite (18) as the West Indies’ struggle reached 133/9 in 17.5 overs. Next articleFrance restaurant refuses to serve Muslim women !